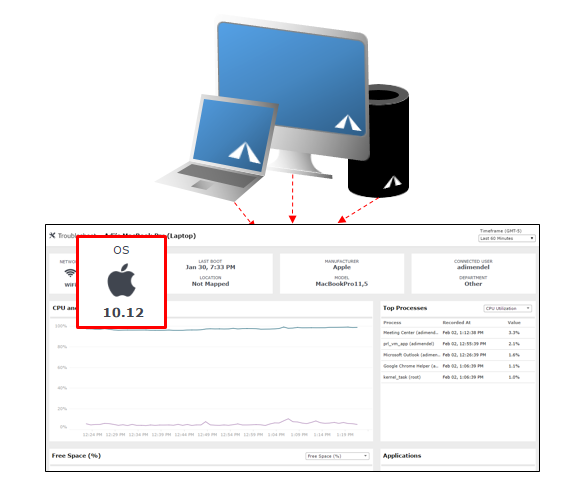 SteelCentral Agent for Mac offers the ability to gather device metrics and performance of managed and discovered native desktop applications and web applications running on Apple Mac computers. SteelCentral Agent for Mac works with both Aternity SaaS and on-premise. Supports an automatic proxy detection at the device level. Supports Aternity Web Activity Creator (Designer and Agent). Create custom activities in the Aternity Web Activity Creator (beta). Automatically connect to Aternity through a proxy. Contact the Aternity Beta Team to obtain the SteelCentral Agent for Mac 3.0 (Beta). You can allocate Aternity licenses to monitor Apple Macs in the same way as other physical devices. You can view a dashboard about the performance of an Apple Mac in the time zone of the device itself. 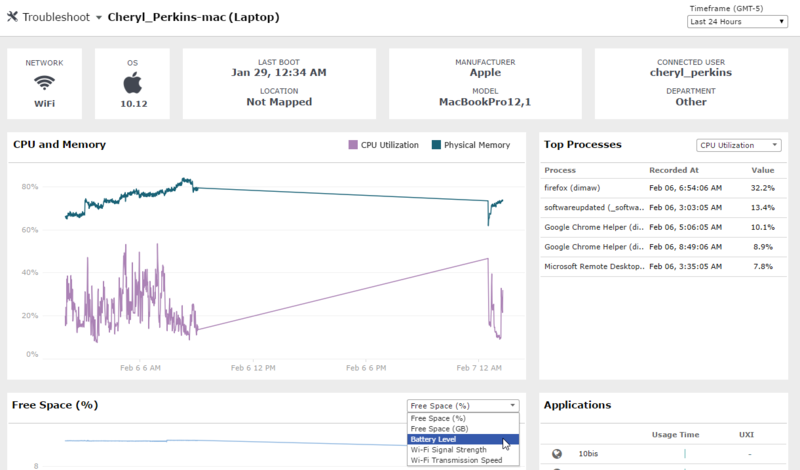 The Agent for Mac monitors the device's details and dynamic resource usage, and its health events, including system and application health events. You can see this information throughout the system, including dashboards like and Troubleshoot Device. You can view this information as part of the Device Health dashboard, Device Details, or in Troubleshoot Device. It monitors the PRC of managed native Mac desktop apps. It monitors the activities of managed web applications, including page load events. It monitors the usage time and wait time for all web applications, and for all native desktop applications (since version 2.4). For details, see the measurements collected by Agent for Mac. You can view this information integrated throughout the dashboards as part of the overall performance of the application, including in Monitor Application and Enterprise Applications.